What Soda Do You Use With Whipped Cream Vodka? Use whipped cream vodka with ginger ale and lime to make an adult limeade. 4 What Kinds of Drinks Can You Make With Triple Sec & Vodka? Whipped cream vodka is a highly versatile indulgence. It easily mixes with most sodas to transform your favorite bubbly drinks into delicious adult treats. Chances are, you already have some soda at home that can pair well with whipped cream vodka. You can simply mix soda and whipped cream vodka and call it a day, or you can make easy cocktails with other ingredients, such as fresh fruit for garnish. If you’re in the mood for something crisp, cool and refreshing, opt for ginger ale with whipped cream vodka. Use twice as much ginger ale as vodka, and pour over a glass filled with ice. If you’d like a fruity twist, add orange juice or pineapple juice, and garnish with an orange slice or pineapple wedge. You can also experiment with adding cherry-flavored vodka or grenadine. Or adding lime juice will give your concoction a limeade flavor. Root beer makes a classic companion for whipped cream vodka. You can easily make a grown-up root beer float. Simply blend root beer, a couple scoops of ice cream and whipped cream vodka until smooth, pour into a large glass and top with whipped cream. You’ll have a delicious dessert or a treat for the end of a long day. If you don’t want to fuss with the blender or ice cream, just mix 2 parts root beer with 1 part whipped cream vodka. Many kinds of citrus soda mix well with whipped cream vodka and you can play with adding fresh fruit garnishes or fresh fruit juice. Choose orange soda to make a creamy orange drink and garnish it with whipped cream and an orange slice. 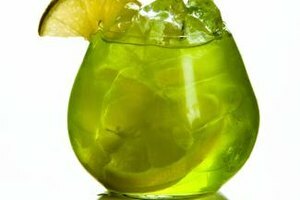 Or for a more tropical flair, use lemon-lime soda and mix in some orange juice. You can also do a mix of pineapple soda, orange juice and whipped cream vodka, garnished with a cherry. Cola or diet cola makes a delicious proper drink when mixed with whipped cream vodka. You can mix cola and whipped cream vodka and have a tasty drink on your hands, or you can add cherry syrup, grenadine or cherries for garnish. If you want to make an all-out dessert, mix together whipped cream vodka, vanilla extract, heavy whipping cream and cola. Pour it in a large glass with plenty of ice and enjoy it with a straw. Can Champagne Be Used in Sangria?